FRANCE may have gone wild with delight in response to the country’s second World Cup win, but there were still some dark clouds to contend with as Didier Deschamps and his players danced in the rain. CNN said France’s World Cup victory, with a team made up primarily of black and Muslim players, “may have been perceived internationally as a collective celebration of an ideal of social mobility and racial equality, but that vision is deeply contested”. Over half of French people believe that Marine Le Pen, leader of the far right in France, represents a “nationalist and xenophobic” party. Worryingly, a lot of folk look to her idea of “nationalism” as the way ahead. CNN added that if French nationalism needed a focus for its inspiration, starlet Kylian Mbappe fits the bill. “He is, in many ways, the embodiment of the ‘French dream’.” Writer Myriam Francois warned, though that, “in today’s France, it simply isn’t enough to hope this victory can plaster over the cracks”. Back in 1998, when France won the World Cup on home turf, the team was nicknamed, “génération black, blanc, beur (the black-white-Arab generation)”. This “rainbow team”, led by Zinedine Zidane, of Algerian descent, was supposedly the future of France. The Guardian’s Andrew Hussey commented that, “this moment did not last long and since then French society, under threat from terrorism and its own internal problems, has undoubtedly become more splintered than ever”. Meanwhile, the Independent wrote that French president, Emmanuel Macron, is hoping for a popularity boost following France’s triumph. 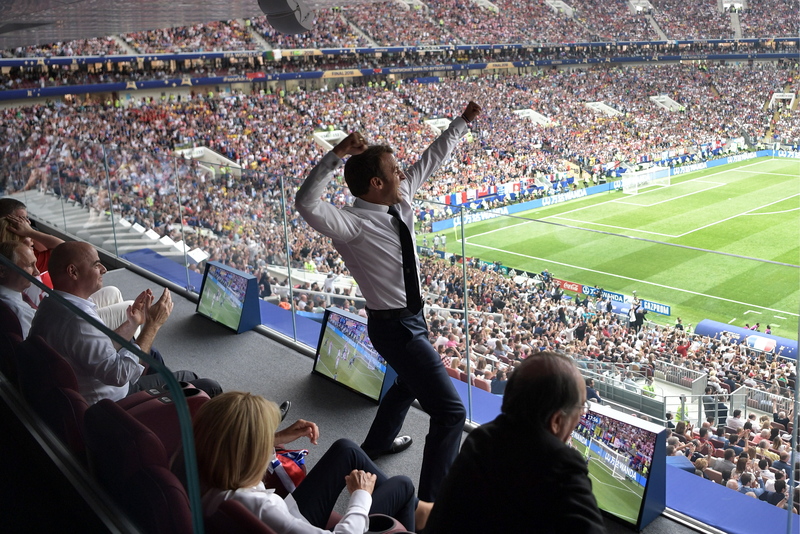 He was conspicuously in the limelight throughout the competition and staged a dramatic celebration in the VIP section as France won. Truly, he recognised that football is the game of the people!